You’re an OB. You love pregnant women and babies and all that this wonderful time entails. And since you’re a good OB, you listen to your moms and relish their nesting behavior. It’s a good sign when they begin talking about Baby’s room and bed, all the cute stuff they’ve gotten from loving family and friends. Now you – and your pediatric colleagues – are going to have to let your moms down gently. Bumper pads, stuffed toys, crib canopies (made popular by Jennifer Lopez’s royal nursery pictures), and even the fuzzy baby blanket Grandma crocheted – none of it belongs in a newborn’s bed. And experts at the American Academy of Pediatrics (AAP) are targeting the issue in big way. 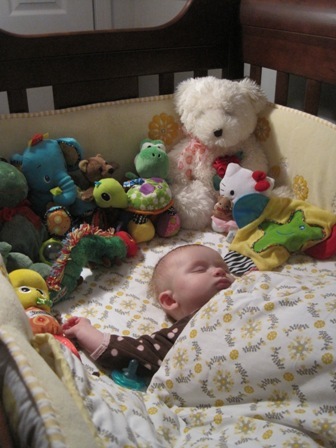 On Oct. 18, the group issued a new policy statement on safe sleep for infants. It turns out that the newest best place for a baby to bed down is totally retro: a nearly bare (but consumer-safety approved) crib with a firm mattress and a single tight-fitting sheet. PJs should be a sleeper appropriate to the room’s temperature without a chance of overheating Baby, who should be sleeping on his back without so much as a blankie. And that’s it. Virtually every OB and pediatrician discusses the topic of Sudden Infant Death Syndrome (SIDS) and supports AAP’s 17-year-old “Back to Sleep” campaign. The push resulted from research that pinpointed stomach- and side-sleeping as significant risk factors for SIDS. Since its adoption, there’s been up to a 66% decrease in SIDS deaths in the U.S. But, Dr. Rachel Moon said at AAP annual meeting, this encouraging trend has a dark twin – a quadrupling in the number of infants who’ve died from suffocation and entrapment. And many of these deaths have been linked to getting stuck in loose bedding, or even from stuffed animals who topple over in the night and obstruct breathing. Sleeping with parents is a big problem too, Dr. Moon said. Many groups – and not a few doctors – have promoted bed-sharing as the most natural way to care for a newborn, especially facilitating breastfeeding, a mighty defense against SIDS. But unfortunately, cross-eyed lethargy – a state familiar to every new parent – does not a safe bedfellow make. And it goes without saying that a parent on pain meds (any of your patients ever have an episiotomy or C-section? ), or who is using other drugs or alcohol, is more likely to roll over on Baby. Deaths don’t necessarily have to be dramatic – like being crushed under adult weight, squashed between parents, or dropped on the floor. Even an arm that moves over a newborn’s mouth can obstruct breathing enough to kill. Babies who sleep in plain cribs with firm mattresses and tight-fitting sheets are at a lower risk of SIDS. More AAP advice? After the 4 a.m. feeding, stress that Baby goes back to her own crib, positioned safely supine, uncovered, and hopefully with a pacifier. Yes, the much-loved binkie now has a justified place in the scientific literature. It seems that pacifiers help reduce the risk of SIDS, probably by occasionally arousing the baby during sucking frenzies. So tell your patients’ thrilled Grandmas to relax and rejoice by contemplating how many pacifiers they can buy for the price of just one coordinated Peter Rabbit crib set. Like it or not, journalists sometimes must act as media sheriffs, enforcing the order in which stories will appear. We say, in essence, “This news cycle ain’t big enough for the both of ya.” Probably too often, the sensational story wins out over the story about a more common problem that’s just as important. This may have happened when the American Academy of Pediatrics published a clinical report in May 2010 on the need for physicians who see children to ask their parents or caretakers about “intimate partner violence,” another term for adult domestic violence that also encompasses violence from partners who live outside the home. The lead author of that report, Dr. Jonathan D. Thackeray, says it didn’t get the attention it deserved because it was overshadowed by the simultaneous publication of the Academy’s policy statement on ritual genital cutting of female minors. The Academy gave Dr. Thackeray a speaking slot in a plenary session at its recent national meeting in San Francisco, which might generate some of that attention his report didn’t received. I don’t know the exact numbers, but I’m betting that intimate partner violence is a more widespread problem in the United States than is ritual genital alteration. One study found that at least 16 million U.S. children were exposed to adult intimate partner violence in the previous year, and at least 7 million were exposed to severe intimate partner violence. Besides putting children at risk for harm, that violence can have long-term effects, other studies show. 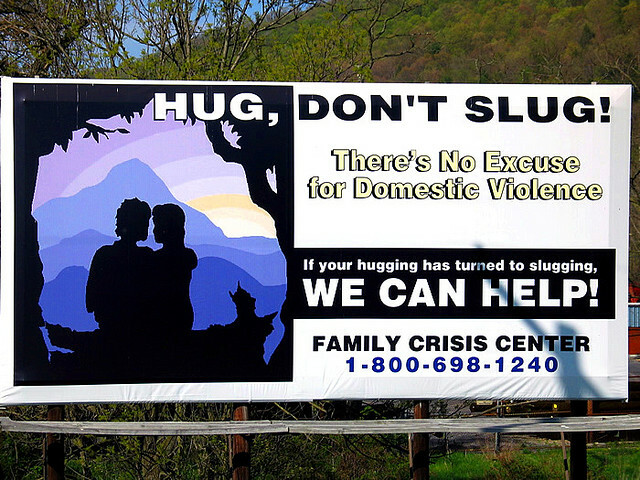 Adults who report childhood exposure to intimate partner violence in the family are three times more likely to report sexual abuse, five times more likely to report physical neglect or abuse, and six times more likely to report emotional or substance abuse. Don’t get me wrong — I think the policy on ritual genital cutting is important too. I’m just glad to see both of these reports get the attention they deserve. Caffeine with Your Energy Drink, Kid? The light bulb went off in Dr. Michele LaBotz‘s head soon after she watched a TV reality show in which a mother encouraged her 6-year-old daughter to down three cans of Red Bull energy drink before a competition. Dr. LaBotz was laughing about this example of bad parenting with the mother of a high-school-age girl who then admitted that her daughter was “down to two cans a day” of Red Bull. That prompted Dr. LaBotz to take a closer look at use of these stimulant-containing drinks and at a related category — sports drinks — and to talk about them at the annual meeting of the American Academy of Pediatrics. I’ve always been acutely sensitive to caffeine, so my nerves started buzzing just listening to her. 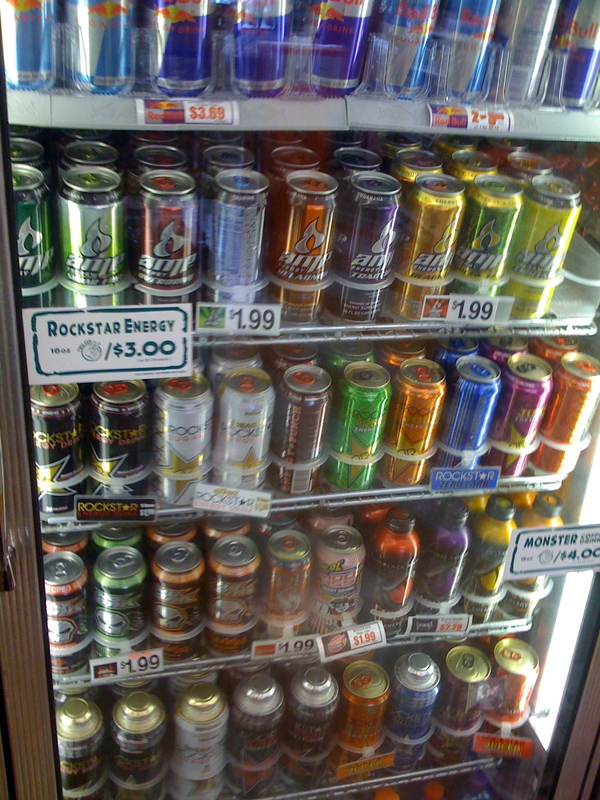 There are no standard definitions, but energy drinks are beverages containing carbohydrates, stimulants, and other ingredients — Red Bull being the 800-pound gorilla on the $11 billion market in energy drinks. 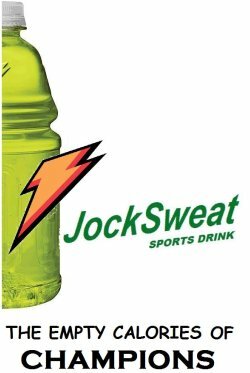 Sports drinks are beverages containing some combination of carbohydrates and electrolytes — with Gatorade claiming 75% of the market share. The “crime” is that these products are found side-by-side with products categorized as food, which are subject to stricter safety standards, Dr. LaBotz said. Red Bull contains 80 mg of caffeine per 8-ounce can, more than twice as much as in two 12-ounce cans of Coca-Cola. Other brands package themselves in larger sizes to get around caffeine regulations or condense into super-caffeine “energy shots” containing 200-350 mg caffeine per 1-2 ounces. The larger 16-ounce size of SoBe No Fear, for example, contains 174 mg caffeine, roughly equivalent to a Starbucks Grande Mocha, except that No Fear also contains guarana, a plant extract that packs another 40 mg of caffeine per gram of guarana. Young athletes start off using them because they think they’ll improve performance in sports or other parts of their lives. New data from a randomized, double-blind, placebo-controlled study that will be published in the December issue of the Journal of Alcohol & Drug Education says that reality is flipped. Sport psychology consultant Conrad Woolsey, Ph.D. and his associates will report that energy drinks make users feel like they’re doing better even though they’re making more mistakes on tests of coordination and multidimensional skills. Sports drinks are a bit more benign but unnecessary and too often take the place of healthier alternatives, potentially depriving young athletes of the nutrients their bodies need to prepare for or recover from exercise. The only time they may be convenient is during exercise lasting longer than an hour, when kids need more fluids, and the bright colors, sweetness and saltiness of sports drinks may entice them to stay hydrated. Do you know the healthy alternatives to recommend to young athletes instead of sports or energy drinks, or how to talk to them about all this? Dr. LaBotz likes the Academy’s “Sports Shorts #6” on Nutrition and Sports, and the useful handouts available from the U.S. Anti-Doping Agency such as the Joy of Sport. And while she urges physicians to take a strong stand against child and adolescent use of energy drinks, she suggests not over-playing the dangers of caffeine, especially when talking to parents who may be regular caffeine users themselves. “I think we lose a lot of credibility if we overstate the risk,” she said. National health officials are encouraging all Americans older than 6 months to get vaccinated for the flu this year (read the story). The recommendation was announced during an influenza press conference sponsored by the National Foundation for Infectious Diseases. This year we think that the three strains of influenza in the flu vaccine are going to be excellent matches with the flu that’s circulating. Our reporter Heidi Splete was at the press conference and spoke with Dr. Daniel Jernigan, who is the deputy director for the CDC′s influenza division, about why it’s important for physicians and their staff to be vaccinated against the flu. She also spoke with Dr. Judith S. Palfrey, immediate past president of the American Academy of Pediatrics, about giving the flu vaccine to children at the same time as other vaccines. Finally, she spoke with Dr. William Schaffner, president of the NFID, about the availability of the the flu vaccine at grocery and drug stores. For other hot medical news, be sure to check out Internal Medicine News. Photo courtesy of Flickr user @cdharrison (CC). If the medical home model of health care ever comes to be, it looks like it’s the pediatricians who will get there first. At least that’s the way it sounds based on comments of outgoing AAP president Dr. David T. Tayloe Jr., during one of the plenary sessions. “When most of my adult friends become ill, they cannot get same-day sick appointments with their primary care physicians. They seek care from an urgent care facility or a hospital emergency department,” he noted. If these adults are very sick, they’re admitted to a hospital for care by a hospitalist team that is employed by the hospital or they are referred out of town for a higher level of care. “None of these entities share the longitudinal health records of my adult friends. So their care is very fragmented and expensive,” he pointed out. from the American Academy of Pediatrics National Conference and Exhibition in Washington, D.C.
We had protesters today here at the AAP meeting. Three of them. They were urging pediatricians not to perform circumcisions, likening the procedure to torture. Given my gender (that’s Ms. Wachter, thank you very much) and my lack of male offspring, it’s not a subject that I had ever given much thought. So I did a little research. Both AAP and the American Academy of Family Physicians seem to take the path of least resistance: the potential health benefits of circumcision–reduced rates of STDs and urinary tract infections, prevention of certain penile problems, and reduced risk of penile cancer–are not sufficient to recommend routine circumcision. Instead, parents should make this decision in light of available information and cultural/religious considerations. Opponents of circumcision argue that the procedure inflicts unnecessary pain on newborn boys and may result in surgical complications. And then there’s the sexual pleasure argument. Purportedly, uncircumcised men enjoy greater sexual sensation than their clipped comrades. At a purely scientific level, a more definitive answer would require studying men who have experienced both conditions. A quick search on PubMed confirmed my suspicion that this sample size is fairly small. But I defer to the medical professionals–yea or nay on circumcision?